Urbana’s Reid Taylor slashes through the Indian Lake defense on Friday. Urbana’s leading scorer for the season, Taylor was again very involved in the Hillclimbers’ attack. Visiting Indian Lake looked polished on the offensive end and shot its way to a 62-46 victory over Urbana in CBC/MRD boys basketball on Friday. It was the third straight loss for the Hillclimbers (7-7, 3-4). Urbana, playing without injured starting point guard Isaiah Fonseca, seemed sluggish on the defensive perimeter and looked lackadaisical closing out. The result was several long-range jumpers surrendered. The Lakers rattled off three in a row from long distance to start the game, and though UHS weathered that storm, the Hillclimbers fell further behind in the second quarter. Urbana’s offense, not built to come from behind, found itself in a 35-25 hole at the half and, despite a slightly grittier defensive performance in the second half, was only ever able to cut the deficit to seven points. Reserve point guard Jevin Edley went down early with an ankle injury and Urbana was forced to have off-ball guards handle the rock. For the game, Urbana was 5-of-17 from the free-throw line, while the Lakers were 9-of-12 and made nine three-pointers. Reid Taylor led UHS with 11 points, Braiden Portis had 10 and Grant Hower and Gavin Spence each had 8. Austin Parker had 23 points for the Lakers. In the jayvee contest, Urbana won, 51-19. Wyatt Teets and Izaiah Underwood each had 11 points for UHS. In the freshman game, the Lakers won, 42-34. Zachary Hoskins had 13 points and Max Keely scored 9 for UHS. 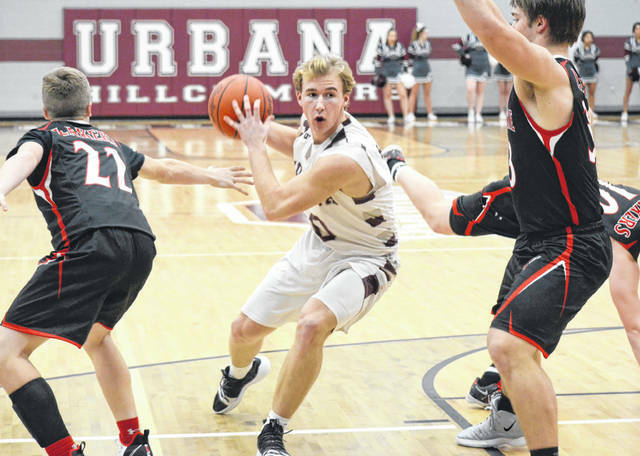 Urbana hosts Bellefontaine on Tuesday before traveling to Graham on Friday in what will be a rivalry-filled week for the Hillclimbers. https://www.urbanacitizen.com/wp-content/uploads/sites/36/2019/01/web1_ReidTaylor012519_ne2019125205020.jpgUrbana’s Reid Taylor slashes through the Indian Lake defense on Friday. Urbana’s leading scorer for the season, Taylor was again very involved in the Hillclimbers’ attack.